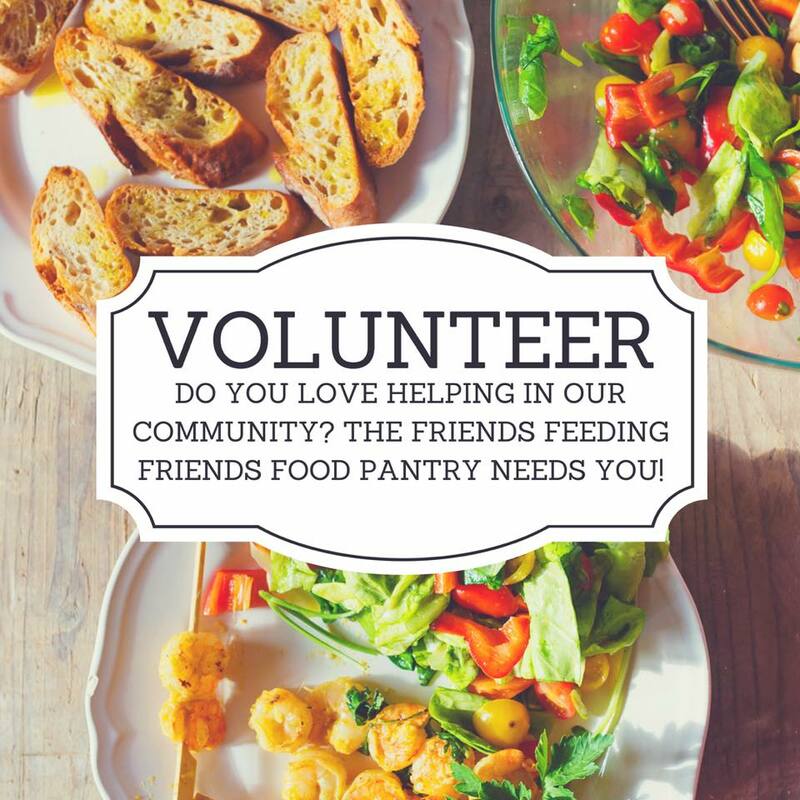 As part of our Friends Feeding Friends program, we like to share news about local food opportunities. Kids can get a taste of local fruits and vegetables this summer—plus their very own money to spend on fresh, local produce—with the new Power of Produce (POP) Club, happening every Sunday from 10 am to 2 pm right at the Canaan Farmers and Artisans' Market June 24th through August 12th! Power of Produce Clubs are simple, fun, and free. 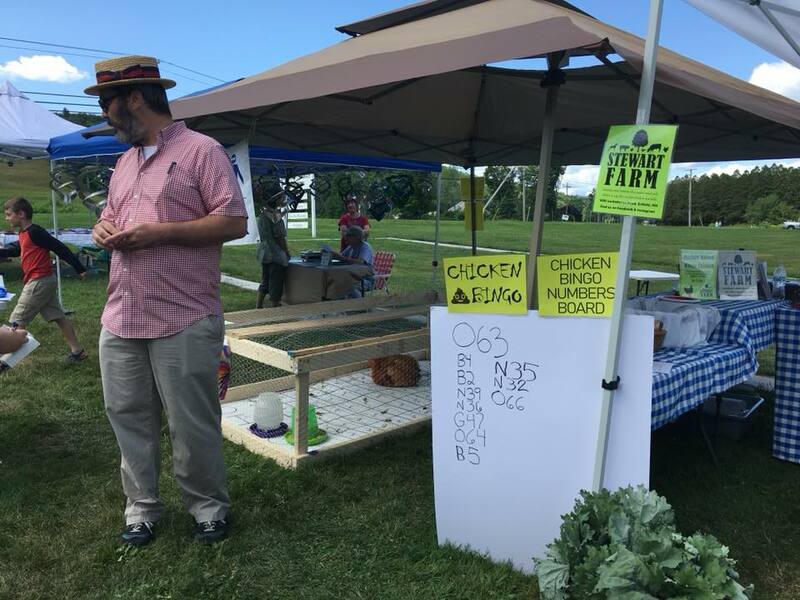 Children sign up at the POP table and start the day’s activity—a farm stand scavenger hunt, a vegetable quiz, an art project, or another produce-related activity. Once they complete the activity, they return to the POP table to receive their POP Bucks: $3 tokens just for kids to spend on local fruits and vegetables here at the farm stand. Kids ages 4-12 can participate once or all summer. So tell your family and friends, bring your kids, and get a taste for POP! They just might start shopping for their own vegetables. Every Sunday this summer from 10 am to 2 pm. 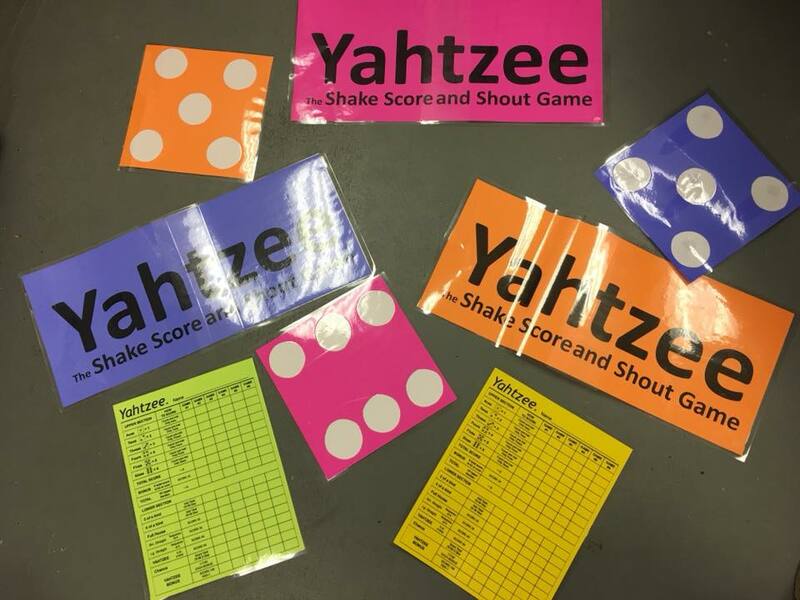 Vital Communities is supporting the POP Clubs this summer, as well as 13 other POP Clubs across the Upper Valley with funding from the New Hampshire Department of Agriculture, Markets and Food, HNH Foundation, and the New Hampshire Charitable Foundation. Thank You for Supporting NH Gives! Together, we did it! 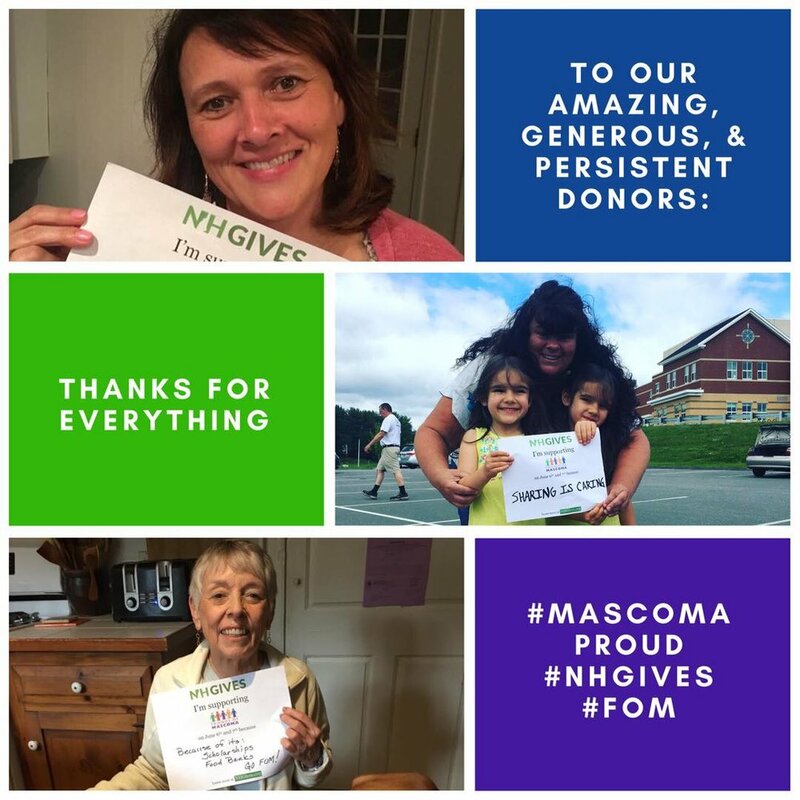 During the official NH Gives 24-hour period of giving (6 pm on 6/6 until 6 pm on 6/7) a whopping 180 unique donors gave Friends of Mascoma a total of $20,255. An additional five donors and four prizes helped bring our overall total to $22,370! We thank you for your outpouring of support! Our nerves are finally settling down after the past 24 hours of excitement, this was the biggest fundraising rally we have ever experienced. Your donations to our scholarship fund, time spent bugging friends and family to donate, and words of encouragement were truly amazing. We also technically had the most donors overall and if you scroll to the bottom of this email, you will see a snapshot of the leader board that shows our ranking. 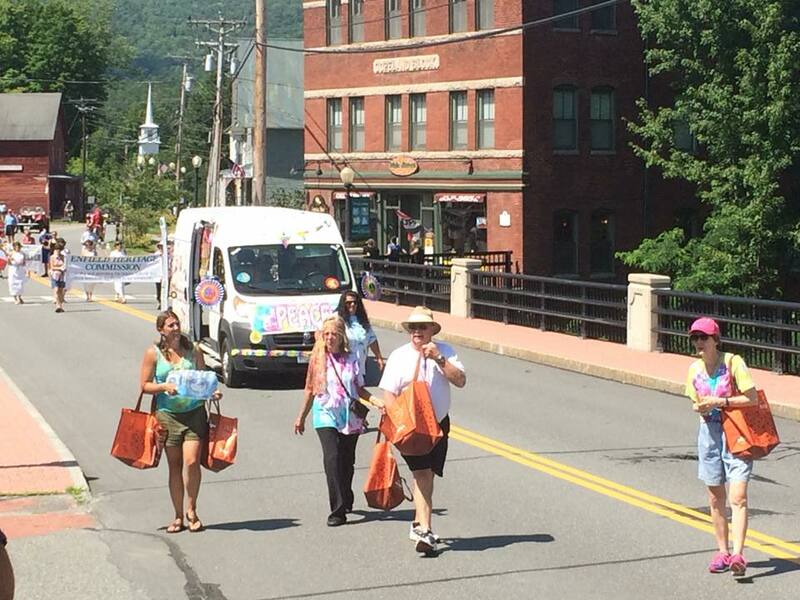 NH Gives was not only a success for us, it was a success for nonprofits throughout New Hampshire. From 6 pm yesterday to 6 pm today 252 nonprofits benefited from 3,787 donors who gave $407,130.70. What a day! Thank you again for your tremendous support! A GREAT GRADUATION GIFT FOR THE SENIOR GRADUATE! 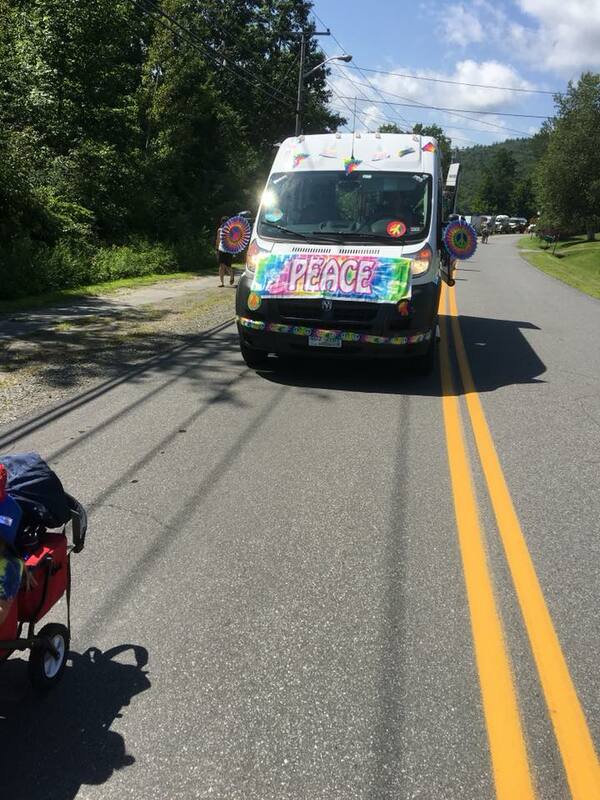 Our wonderful partners, the New Hampshire Food Bank will bring their Mobile Food Pantry to the Mascoma Valley on Saturday, June 2, at 11:00 AM. Food will be given away First Come, First Serve. We will be located at the lower left parking Lot at the MVRHS. In case of extreme weather look for us in the High School Cafeteria. No ID required or registration. Bring a cloth bag if there is any produce available. Want to volunteer? Please come at 10:00 AM to help the Food Bank set up and distribute. NH Gives is almost here and we are super excited! Last year we raised over $16,000 for our scholarship fund during NH Gives and we hope to do the same this year. In order to be as successful as last year, we need your help! Sign up to be a fundraising champion. Go to our NH Gives profile, click the "Fundraise" button, and follow the prompts to set up your fundraising profile. 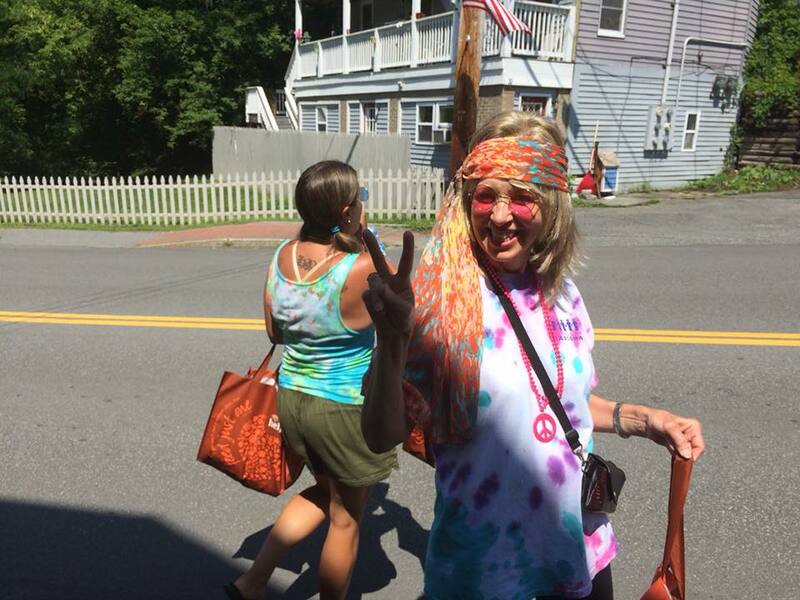 First fundraising champion to raise $1,000 wins a Friends of Mascoma t-shirt! Participate in the unselfie challenge on Facebook. Download the PDF sign, print it and write why you are supporting Friends of Mascoma, and post it to our Facebook page with the hashtags #unselfie #nhgives and #friendsofmascoma. 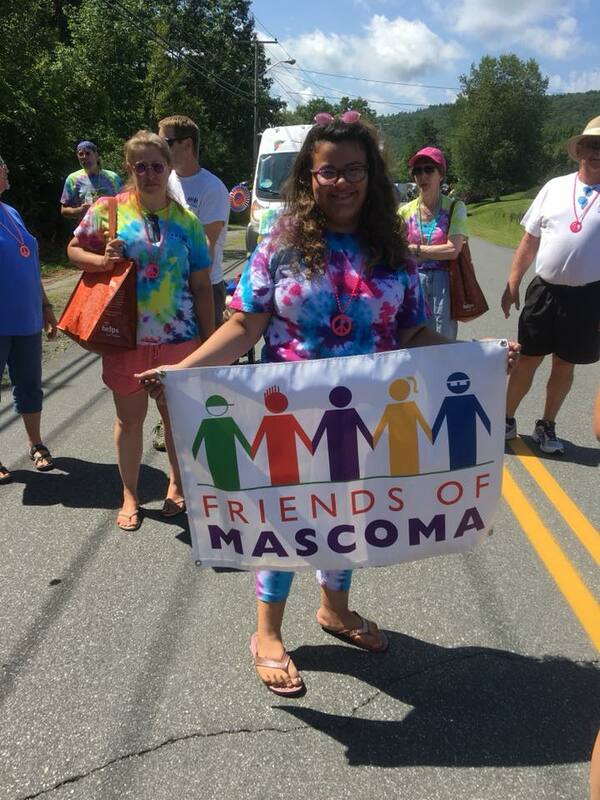 Ask five of your friends and family members to donate $5 to Friends of Mascoma. Tell everyone you know about NH Gives and the great local nonprofits who are participating. Want more information? 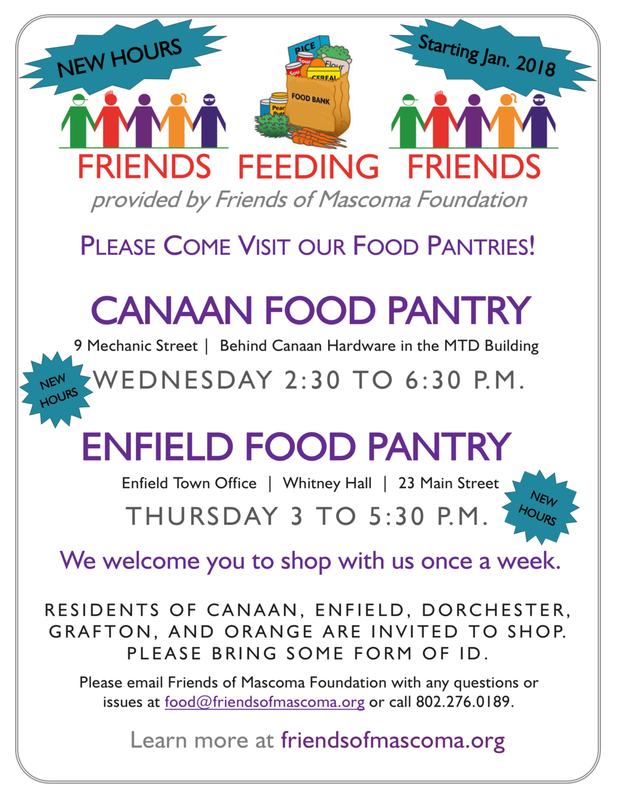 Email info@friendsofmascoma.org. Thank you in advance for your support! Snacks for Schools Drive Collects 286 Pounds! We are pleased to announce that 286 lb. of snacks were collected for distribution to our schools. 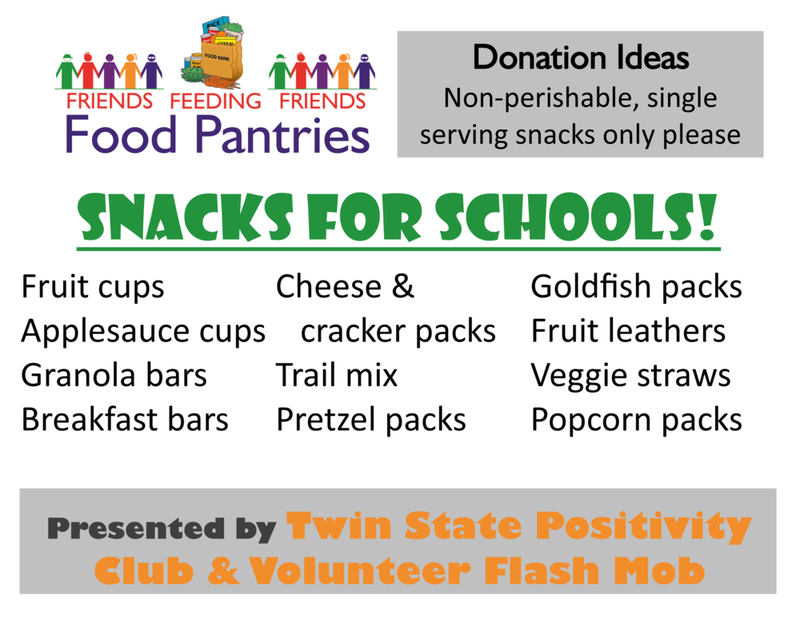 Many thanks to Twin State (NH/VT) Positivity Club and Volunteer Flash Mob for organizing the Snack for Schools Food Drive. The Drive brought in a wide variety of single-serving, non-perishable snacks in all shapes, sizes, and forms and even utensils. We also received much appreciated monetary donations and reusable bags. 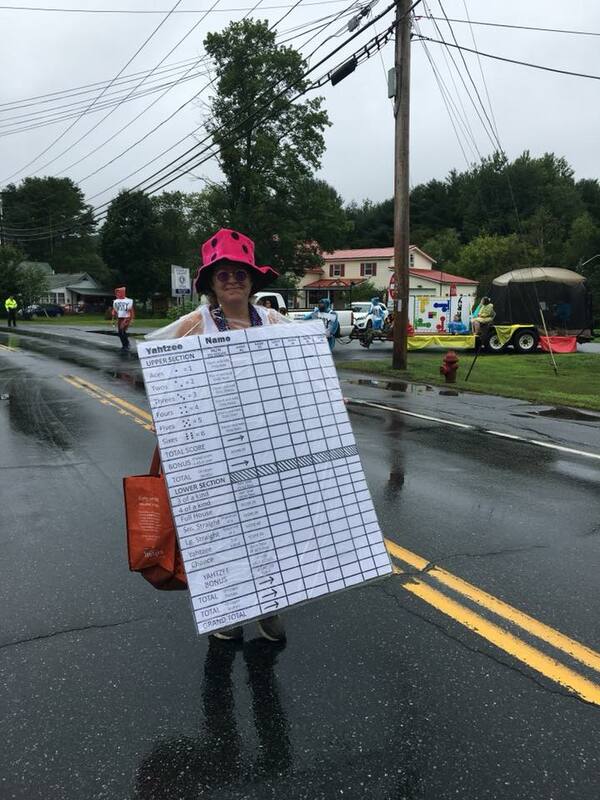 Thank you to Jessica Bishop Grace, Tim Lenihan, Amity Alize, Bridget Labrie, Canaan Hardware, Canaan House of Pizza, Community Lutheran Church, Enfield House of Pizza, Family Pharmacy, Raq on Dance and everyone who contributed, shared news about our drive, and transported items and organized. Special thanks Lana Evans for keeping tally for us throughout the month! Teachers and staff offer these snacks to fuel our young learners in all four schools throughout the day so they may focus on their studies. While this Drive is over, snacks and other donations are always needed and appreciated any time of the year. We are sharing a list of ideas for single-serving snacks in case you are looking for inspiration. Snacks of all sizes are welcomed; the single-serving ones are geared for easy distribution and often sent to the schools. April 5th was a blustery and cold day, but that did not discourage a good crowd from attending the Seasons of Growth tapestry hanging and student art display! Becky Powell, Chris Morse, and Dave Shinnlinger shared details on how they worked with the students to help the tapestry come to life: from building the loom, to creating the artwork that inspired the design, to weaving. It was truly a community project and we thank everyone who helped along the way. To see more photos please visit us on Facebook. Friends of Mascoma Foundation and other local nonprofits are participating in NH Gives again this year. 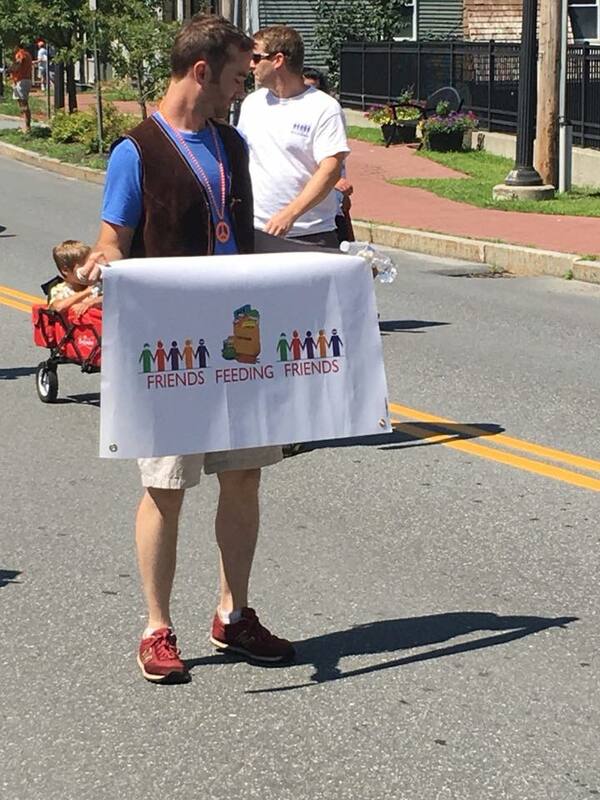 NH Gives is a 24-hour period from June 6th to June 7th were nonprofits are celebrated. This is our third year participating in this great event. We are raising money for our scholarship fund again this year and need your help! If you would like to help hang posters, set up a personal fundraising page, or donate a prize to encourage donors please email Holly West at hspwest@friendsofmascoma.org. will be bringing their awesome Mobile Food Pantry to our Friends Feeding Friends food insecurity program on a Saturday morning, June 2. We will keep you posted on exact time and location! This incredible opportunity has the capacity to give a food boost to approximately 200 families. At long last, our 2017 annual report is ready! Want a paper copy? 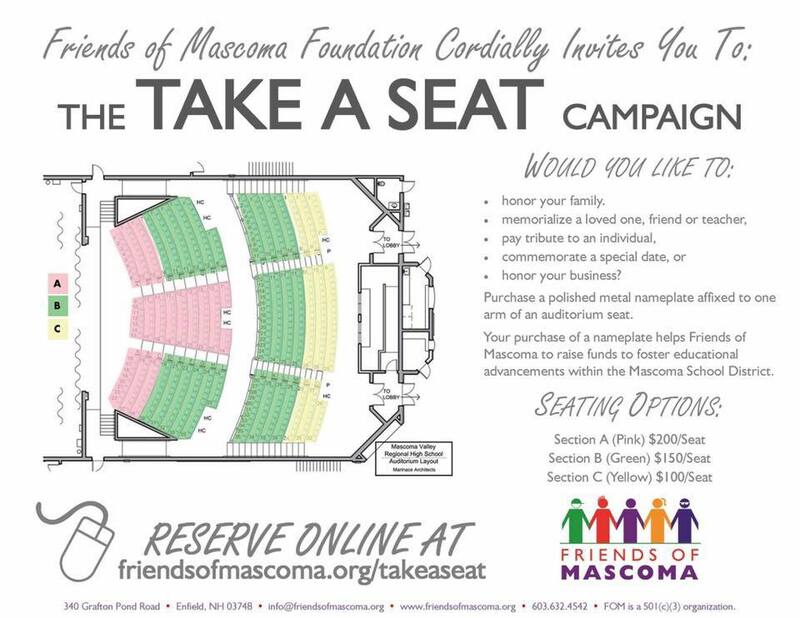 Shoot us an email at info@friendsofmascoma.org to request one. Thank you for your continued support! Friends of Mascoma Foundation and other local nonprofits are participating in NH Gives again this year. 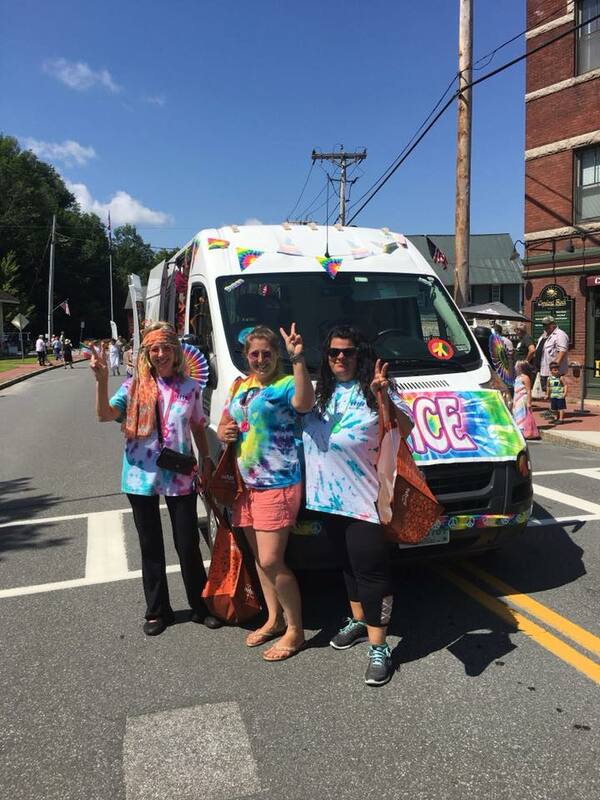 NH Gives is a 24-hour period from June 6th to June 7th were nonprofits are celebrated. Please stay tuned for details from us and other local nonprofits! Spring is finally here and we are making garden plans! If you are interested in volunteering to help plant and care for gardens at EVS, MVRHS, or the Canaan food pantry please email us at info@friendsofmascoma.org.